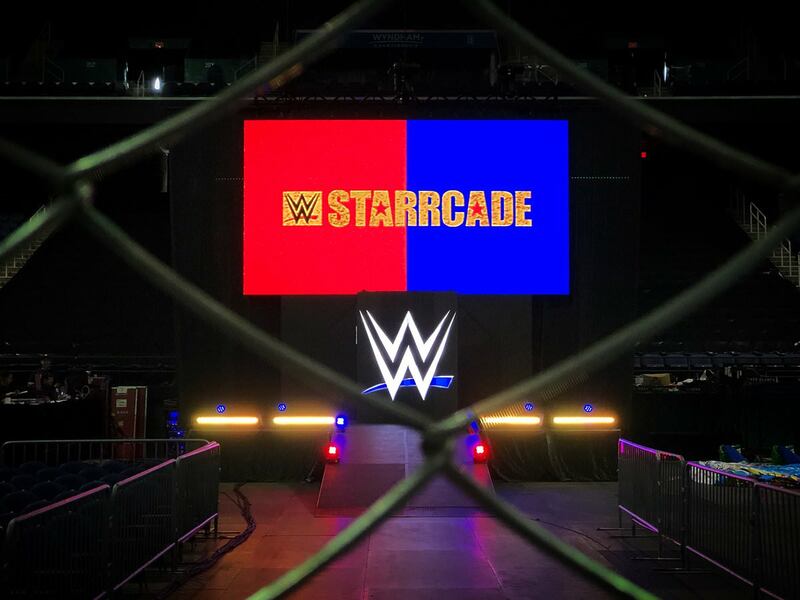 We're looking for reports from the WWE shows with the Raw crew in Nashville and the Smackdown crew in Greensboro for the Starrcade show featuring A.J. Styles vs. Jinder Mahal for the WWE title and Charlotte Flair vs Natalya for the women's title, both in cage matches, with guests like Ric Flair, Ricky Steamboat, Ricky Morton and Robert Gibson to newstips@wrestlingobserver.com. Tomohiro Ishii & Toru Yano vs. Lance Archer & Davey Boy Smith Jr.
Sunday has WWE shows with the Raw crew in Huntsville, AL and Smackdown in Roanoke, VA. Raw will be live on Monday night in Knoxville. There is also a Smackdown house show on Monday night in Charleston, SC. Smackdown and 205 Live will be taped on Tuesday in Lexington, KY with A.J. Styles vs. Singh Brothers in a handicap match and Kevin Owens vs. Randy Orton. Wednesday will be NXT TV tapings at Full Sail University in Winter Park, FL. The single most important business story for both WWE and UFC, regarding the biggest stable revenue stream for both, television rights fees, is the lead story in the new issue of the Observer. With UFC's contract coming due in 2018 and WWE in 2019, look at official talks by UFC, unofficial talks by WWE, the uniqueness that the same person is negotiating both new contracts, how they are intertwined, who had expressed interest in UFC and what kind of money do they want and what is being offered, and how WWE strongly ties into all this. Look at the money both companies are getting, the current exposure, and who are the big players in the game. Also look at the risks of WWE leaving USA and why a drop in ratings may still be strongly to their benefit. Look at the details of how and why the planned Royal Rumble main event match is no longer taking place. Look at the reasons behind it as well as the complete 2018 WWE PPV schedule, and why WWE is cutting back on shows and changing the format in others. This issue has complete Survivor Series weekend coverage, including business notes, why things took place the way they did, injury updates, what did and didn't work along with poll results and match-by-match coverage plus star ratings. Check out full coverage of the NXT Takeover special, the changes in War Games and business notes. Plus, more on ticket sales for the Tokyo Dome show and the history of those ticket sales, as well as negotiations updated regarding viewership of the show in the U.S.
Read why Roman Reigns won the IC title, update on John Cena's schedule, Jennifer Hudson-David Otunga breakup, Ric Flair's lawsuit against his former agents, a potential new WWE TV show, why NXT is taping at Center Stage, A.J. Styles talks his future including retirement, details of all the women that were brought up to the main roster, Kevin Owens documentary, WWE cancels another show, weird WWE Network mailer, the real story behind the origination of Starrcade, and notes on this year's Tribute to the Troops show. Arn Anderson made an appearance at tonight’s Starrcade house show in Greensboro as the special guest enforcer for Bobby Roode vs. Dolph Ziggler, giving Ziggler a spinebuster. Charlotte Flair cut a promo about Starrcade’s importance to the Flair family. WWE posted video of Ric Flair and Dolph Ziggler backstage at Starrcade. Kevin Owens was very excited for Starrcade in a video on Instagram. Owens thanked Cody Rhodes for calling him one of Dusty Rhodes' guys. With Starrcade taking place tonight, ESPN looked back at WCW’s mishandling of Starrcade 1997. This week’s WWE top 10 list on YouTube focuses on the best moments of Paige’s career. Chris Jericho was joined by Chavo Guerrero (GLOW’s stunt coordinator), Kimmy Gatewood, and Rebecca Johnson from Netflix’s GLOW to talk about the behind the scenes of the series. Jericho revealed that he auditioned for a role that ended up going to Alex Riley. Chavo said The Miz auditioned for the part as well. Finn Balor tweeted the results of a WWE.com poll that had him as the leading choice for who people wanted to see Brock Lesnar face next from the Raw roster. When speaking with the Times of India, Kane said Jinder Mahal is someone every WWE wrestler should strive to become because of how he improved in the ring and improved his body before making his way back to WWE after being released. NJPW launched an English-language YouTube channel, featuring subtitled promos from Thursday’s World Tag League show. WrestleCade tweeted that Terry Funk had to leave their convention to be with his wife after she fell ill last night. Powerbomb.tv and Beyond Wrestling reached a deal on a multi-year distribution partnership. Despite losing to Kelvin Gastelum in a first round knockout today, Michael Bisping said he still plans on having his retirement fight at UFC’s show in London next year. Bisping’s losses to Georges St-Pierre and Gastelum are the first time he’s lost back-to-back fights in his career. Gastelum wants a bout against interim middleweight champion Robert Whittaker next. Cris Cyborg said beating Holly Holm will feel like getting a win against Ronda Rousey. Miesha Tate said Holm has the best chance of anyone to beat Cyborg right now. Amanda Nunes expressed her displeasure with how the UFC has promoted her.